Dubai is absolutely built on tourism, an industry that, if it were to disappear, would cripple the young city overnight. While Dubai does actually have a lot of culture and history, most Dubai tourism is built up of visitors and expats looking to experience all of the glitz and glamour they hear so much about. Dubai tourism revolves around an ever growing list of some of the most impressive man-made buildings and structures anywhere on Earth. From the Burj Khalifa, the world's tallest building, to the Burj Al Arab, the world's only seven-star hotel, to The Palm, the largest man-made island in the world, the opportunities to see some of the most beautiful structures ever built are endless. For visitors coming to Dubai for the first time, there are some classic attractions you must visit, but there are also a ton of hidden gems in Dubai you can't miss if you have the time. If you're coming to Dubai for the first time you must see the largest mall in the world, the Dubai Mall. In 2011 it was the single most visited building in the world with over 54 million shoppers visiting the over 1,200 stores within its doors. Just outside the Dubai Mall are the gorgeous fountains, the largest and most impressive fountain show in the world. If you are a shopaholic, check out our complete guide to Dubai Malls for details and info on all the top malls in Dubai. Take the time to plan a dinner at one of the restaurants with outside seating at Souq Al Bahar, a cluster of top restaurants on the edge of the fountains. Music and lights are incorporated into fountain shows happening multiple times per hour daily. What is more impressive than the Dubai fountains? The world's tallest building, the Burj Khalifa, which is built on the edge of the fountains. Make sure to visit At.mosphere, the tallest bar in the world located on the 122nd floor of the Burj Khalifa. Once you are done downtown, make sure to jump on the metro or in a taxi and head down the Burj Al Arab or The Palm, but a few miles south of downtown. As the world's only seven-star hotel, the Burj Al Arab isn't open to the public so you'll need a reservation at one of their restaurants or bars (with a minimum spend) in order to visit. 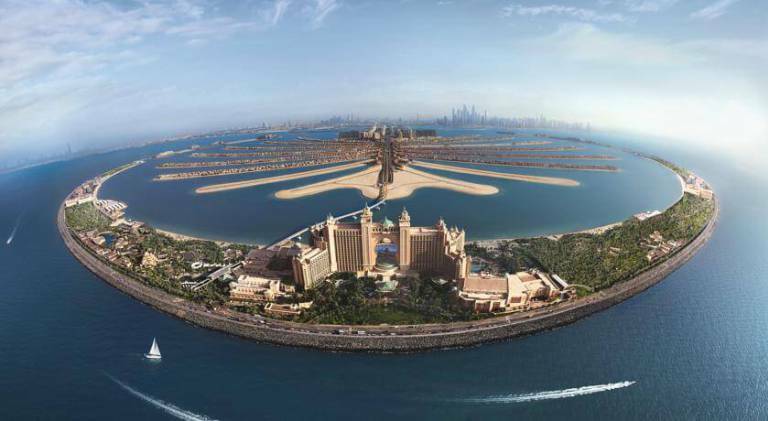 The Palm remains one of the most amazing projects ever undertaken and from above, it is breathless. A trip to the Atlantis, the world famous hotel at the crown of the structure is a popular Dubai tourism hot spot, visited by busloads of tourists each day. If you make the trip out, make sure to spend a few hours at Aquaventure, an insanely large water park attached to the hotel, complete with a dolphin park and a pool you can swim in with sharks. Have an extra day or two? Make sure to head to old Dubai and visit the gold and spice souqs as well as take a ride on an abra, an old wooden boat, for only 1 dirham. Also, make sure to head outside of the city and do a desert tour in the vast emptiness just outside of Dubai. Dubai is one of the most unique cities in the world and the opportunities for life changing experiences are everywhere, especially if you plan straight.